This new 2018 version of our website, is intended to make Welcome Anchorages more accessible to cruising sailors afloat and ashore, and to provide more information about services available around the coast, while complementing our popular printed edition, widely available. It also enables you to tell us about changes you encounter at destinations around the coast, and to browse through advertisers information in our ‘directory’ pages. Browse our directory of yacht services categorised by each of the main regions covered by the publication; All Scotland, North Ireland, Firth of Clyde, Argyll Coast, North West Scotland and finally the East Coast and Northern Isles. This new 2019 version of our website, is intended to make Welcome Anchorages more accessible to cruising sailors afloat and ashore, and to provide more information about services available around the coast, while complementing our popular printed edition, widely available. View or download Welcome Anchorages, free. Welcome Anchorages vous souhaite bienvenue aux côtes d’Ecosse et Irelande. Prenez la chance d’avoir une bonne croisière ici. Bonnes vacances! Welcome Anchorages säger hej til alle skandinaviska seglare. Ni er mycket välkomna i skotska og irska vatten og vi hoppas att Ni vil njuta att segla här og ha en bra segelupplevelse. Welcome Anchorages möchten allen deutschen Seglern hallo sagen. Sie sind herzlich willkommen im schottischen und irischen Wasser. Wir hoffen, dass Sie geniessen, hier zu segeln, und wir wünschen Ihnen eine schöne Fahrt. 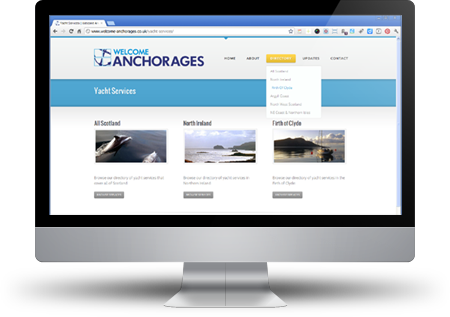 Welcome Anchorages is a guide to shore facilities for cruising yachts at around 150 locations around the coasts of Scotland and the north of Ireland, from the Mull of Galloway in the south west of Scotland to Peterhead in the north east, including the Orkney and Shetland Isles. The new Irish coverage is from Sligo in the west, northabout to Ardglass in the east. 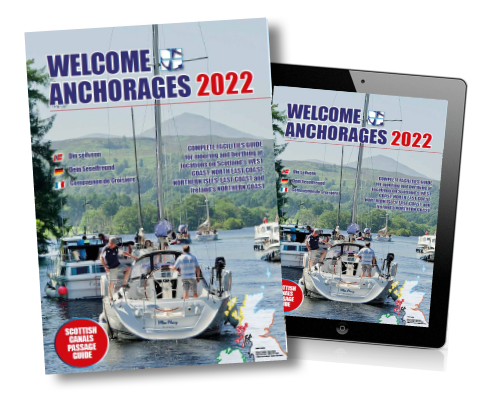 Welcome Anchorages is a free publication published to inform the cruising sailor in Scottish and N Irish waters about the facilities and services available in marinas, ports and harbours. It is available from marinas, chandlers, and at Boat Shows. If you cannot get one easily, get in touch via the contact section of this website. Feedback is always welcome, and information about changed, missing, or new facilities is particularly welcome. Get in touch via the contact section of this website.